It is so great I love the music yes it was perfect!!!!!!!!!!!!!!!!!!!!!!!!!!!!! Love my Disney, particularly their old school animation. For this movie, what really did it for me aside from the usual outstanding animation was the music. If you're a fan of Dixieland and New Orleans Jazz, the soundtrack will be for you too. Otherwise a familiar tale done with the usual Disney flare. My daughter and I loved the movie! Such a great story! Nice story. Highly recommend it. Great music! Made me want to visit New Orleans. This is the best disney princess movies of all time. I've seen it twice, and I loved it!! I love this movie it such a twist of The Frog Prince. I love the songs and characters, their so funny. Tiana is definetly my favorite disney princess! This is excellent! great voice acting, great writing, great animation, great everything! This is a classic iloved it especially the music! i luv it alright but.....it's not perfect..gud job! Umm Hercules has devils in it and Mermaid has a witch and Disney has other movies similar... No biggie! UH -HEllo little mermaid had a witch in it too and it wasnt scary.If your going to keep your children locked in a bubble then dont watch this movie. I wonder what walt disney has become? Scary parts...ghosts .... demons and voodo practices. If I had seen this movie before I brought my 5yr old I would not have brought her. This movie is perfect for the entire family. It has funny, cute, and serious moments, in a language all members of the family can understand. It's fun to see the young ones laugh so hard at the silly moments, and see them get serious at the calm moments. 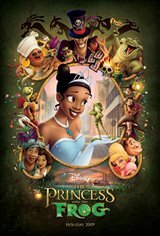 A wonderful tale of the Princess and the Frog. I havenÈt stopped talking about this movie since I saw it. The bad thing with this is that I am 30 and I had to borrow my friends children to watch it. It was traditonal Disney movie - a feel-good movie, but made to suit the generation we are in. Any kid over 3 years old will love it. In my opinion, every adult will love it too. This movie was awesome. It made me fall in love with Disney movies all over again. My three year old loved it and was not scared one bit. The music was very good, true to classic disney movies. This will definitely be one to buy. I loved this movie!! It had many cute moments and lots of humour. It brings back the style of the old classic disney movies. The classis love story is evident and perfect. A great twist on the classic story. It is absolutely brilliant. I recommend this to anyone. The people who are complaining about it being too scary for children obviously never read any real fairy tales, or let their kids watch anything else but the Wiggles. The music is fantastic, and fits into the setting of New Orleans perfectly. And oh my goodness! It has a plot! And a strong female character who isn't helpless! I love it. Words cannot describe how (epicly) awesome this movie is. I would like to give a sincere thanks to all the wonderful people who put their best efforts and talent to this beautiful materpiece of animation. This movie is full of voodoo and references to the occult. It should not be rated "G" and is not suitable for children. The music was wonderful. My eight year old daughter really liked it. I myself postponed going to the restroom during the movie as I did not want to miss any of the story. I thought it was okay. It got boring half way through. I think that it was too long. I don't reccomend it for young children. The animation was great. I wouldn't watch it again. 2D animation goes strong with this movie, it was as good as Aladdin! Really loved it. Excellent movie for everyone in the family. The animation is breath takening and the music is amazing. A grand return to the classic Disney stylings of animation. Truly loveable characters, great music and a wonderful storyline! This will be a Disney classic! Anything Disney is amazing.. love that this is the classic animation! Such a wonderful story! Great movie but not for kids under four my nepthew was afaird. Wonderful movie! Every kid of any age and race will enjoy the movie. It was funny, sad,happy, romantic. It was a fantastic moive. So good. Definitely some parts that were scary for the kids but a definite princess movie that could become a favourite. I will it was out of 10, because I wanted to give it 10. It was so awesome and amazing! I liked all of it and you will too. Now I want to see you at the movies watching that! Go!